Happy May! Holy cow.. can you believe how fast April flew by? Our calendars were packed solid with twirling contests, auditions, fundraisers, golf tournaments, ring ceremonies, school work, Netflix, etc. We are so excited that May is here because 1) It’s Sarah’s Birthday month and 2) it is the beginning of Summer!!! To start off our Monthly Goal blog post we are going to update you on how we did on last month’s goals. 1. Study for the GRE 4 time a week – Complete joke! HA! I was a little too preoccupied with my current undergrad assignments (over 25 pages of written assignments, 5 quizzes, 4 exams, 1 group project, plus studying for 3 final exams). The closest I got to opening my book was pulling it off my shelf only to put it back down on my desk. Whoops! Good thing I believe in second chances. 2. Focus on the positive – It’s crazy how writing down things that you are thankful for can change your attitude. I wrote down the mundane and the monumental and it made me realize how much the good can outweigh the bad. 3. Use less heat on my hair – I did surprisingly well on this goal and I know my ends appreciated a break from all the heat. Cut down on sweets- This has been my most successful goal yet! Even though I still enjoy a cookie everynow and then I have really cut back. However, I am not sure how much longer I can do this one with the new Sonic Blue Raspberry with Nerds Blast. Seriously.. they are amazing!2. I love my May Book Planner- I use it everyday and it is too too cute! 3. Laundry once a week- HAHA.. epic fail! 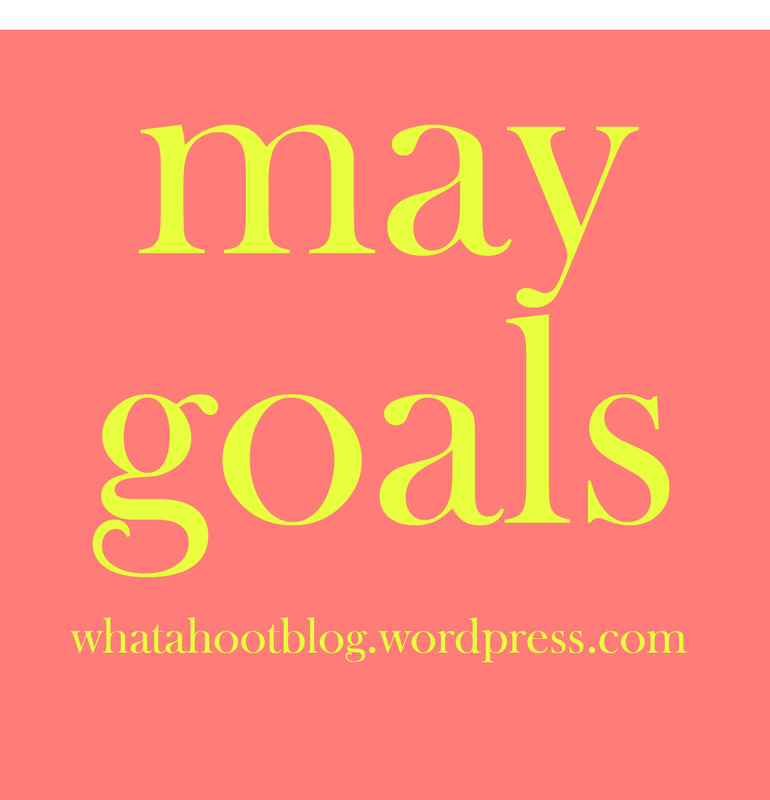 Now, onto our May goals! 1. Study for the GRE – let’s try this again. 2. Start my summer reading list – I have been wanting to read all of Shauna Niequist’s books for a while now but school has always been in the way. This summer I want to dedicate each month to read Cold Tangerines, Bittersweet, and Bread & Wine. 3. To eat out less – Whenever my pantry and refrigerator suddenly becomes empty I tend to go buy meals rather than going grocery shopping. I want to start eating in more regularly. Hopefully this will trim my waistline instead of my wallet. Focus more on the positive. It is so easy to get sucked into negative toxic conversations and I would much rather spend my time being positive! Respond to text messages and phone calls faster. I have gotten into such a horrible habit of not responding promptly and I hate it. I will be having surgery on my hip next week and my goal is to be able to put weight on my foot by the end of the month! So, how did you do on your monthly goals for April? What do you hope to improve about yourself during the lovely month of May?